Erin McLaughlin and Holly Yan, “Antwerp Police Intercept Speeding Car and Thwart ‘Attempted Terrorist Attack,’” CNN, March 23, 2017, http://www.cnn.com/2017/03/23/europe/belgium-antwerp-car-intercepted/. Stockholm,David Crouch and Helena Bengtsson, “Truck Drives into Crowd in Stockholm, Killing Four People,” Guardian (London), April 8, 2017, https://www.theguardian.com/world/2017/apr/07/truck-crashes-in-central-stockholm-sweden. Paris,Henry Samuel, “Paris Police Launch Terror Investigation After Car 'Deliberately' Crashes Into Police Van On The Champs-Elysees,” Telegraph (London), June 19, 2017, http://www.telegraph.co.uk/news/2017/06/19/police-operation-way-champs-elysees-paris/. Barcelona,“Barcelona Attack: Van Driven Into Crowd In Las Ramblas District - Latest Updates,” Guardian (London), August 17, 2017, https://www.theguardian.com/world/live/2017/aug/17/barcelona-attack-van-driven-into-crowd-in-las-ramblas-district Edmonton,Madison Park and Dakin Andone, “Five Hurt as Edmonton Attacks Spark Terror Investigation,” CNN, October 2, 2017, http://www.cnn.com/2017/10/01/americas/edmonton-vehicle-attacks-investigation/index.html. and New York.Benjamin Mueller, William K. Rashbaum, and Al Baker, “At Least 6 Reported Dead as Truck Careens Down Bike Path in Manhattan,” New York Times, October 31, 2017, https://www.nytimes.com/2017/10/31/nyregion/police-shooting-lower-manhattan.html?hp&action=click&pgtype=Homepage&clickSource=story-heading&module=a-lede-package-region&region=top-news&WT.nav=top-news; Melanie Grayce West, Kate King, and Mara Gay, “Eight Killed in Terror Attack in New York,” Wall Street Journal, October 31, 2017, https://www.wsj.com/articles/at-least-6-die-in-lower-manhattan-incident-1509483701. On August 14, 2018, an attacker struck pedestrians and bicyclists in London before crashing his car into security barriers outside the Houses of Parliament, leaving three people wounded.“Westminster car crash: Man arrested on suspicion of terror offences,” BBC News, August 14, 2018, https://www.bbc.com/news/uk-45180120; William Booth, “London police: Car rampage outside Westminister treated as ‘terrorist incident,’” Washington Post, August 14, 2018, https://www.washingtonpost.com/world/europe/car-smashes-into-security-barriers-outside-britains-parliament-driver-arrested-amid-injuries/2018/08/14/c778ce66-9f97-11e8-8e87-c869fe70a721_story.html?utm_term=.8eec4ea9eaa6&wpisrc=al_world__alert-world&wpmk=1. Lizzie Dearden, “Man Who Drove Into Pedestrians Shouting Allahu Akbar ‘Was Just Singing Along To Rap Music While Buying Pizza’ Parents Say,” Independent (London), October 7, 2016, http://www.independent.co.uk/news/world/europe/vienna-favoriten-car-ramming-attack-allahu-akbar-pizza-against-isis-rap-music-singing-cannabis-a7349876.html. In November 2016, Somali-born Abdul Razak Ali Artan carried out a car and knife attack at Ohio State University, wounding 11 people.Katie Mettler, “Ohio State Attacker Complained Bitterly in Facebook Post of Treatment of Muslims ‘Everywhere,’ Report Says,”https://www.washingtonpost.com/news/morning-mix/wp/2016/11/29/ohio-state-attacker-in-facebook-post-complained-bitterly-of-treatment-of-muslims-everywhere-reports-say/. In December 2016, Tunisian-born Anis Amri charged at pedestrians attending the Christmas Market in Berlin, killing 12 people and wounding 56 others in an attack claimed by ISIS. Footage released by the ISIS-affiliated Amaq News Agency showed Amri pledging allegiance to the group’s leader, Abu Bakr al-Baghdadi, vowing “we will slaughter” the “crusaders who are shelling the Muslims every day.”“Anis Amri: Three arrested including suspect’s nephew,” CNN, December 24, 2016, http://www.cnn.com/2016/12/24/europe/anis-amri-berlin-attack-milan. CEP has documented at least 40 vehicular terrorist attacks since 2006, collectively resulting in the deaths of at least 197 people and the injury of at least 1,066 others. Erin McLaughlin and Holly Yan, “Antwerp Police Intercept Speeding Car and Thwart ‘Attempted Terrorist Attack,’” CNN, March 23, 2017, http://www.cnn.com/2017/03/23/europe/belgium-antwerp-car-intercepted/. On April 7, another assailant carried out a suspected terrorist attack, this time in Sweden, hijacking a truck and careening into crowds of pedestrians at the Ahlens Mall in Stockholm, killing four people and wounding 15 more.David Crouch and Helena Bengtsson, “Truck Drives into Crowd in Stockholm, Killing Four People,” Guardian (London), April 8, 2017, https://www.theguardian.com/world/2017/apr/07/truck-crashes-in-central-stockholm-sweden. “Islamic State Claims Responsibility for London Attack,” Reuters, June 4, 2017, http://www.reuters.com/article/us-britain-security-claim-idUSKBN18V14P?il=0. On June 19, 2017, an assailant drove at a crowd of worshipers near a mosque in north London, leaving at least eight people wounded.“What We Know So Far About the Finsbury Park Terror Attack,” Guardian (London), June 19, 2017, https://www.theguardian.com/uk-news/2017/jun/19/what-we-know-so-far-van-hits-pedestrians-near-london-mosque. Later that day, an armed assailant rammed his vehicle at a police car on the Champs-Elysees street in Paris, seriously injuring himself but leaving no other casualties.Henry Samuel, “Paris Police Launch Terror Investigation After Car 'Deliberately' Crashes Into Police Van On The Champs-Elysees,” Telegraph (London), June 19, 2017, http://www.telegraph.co.uk/news/2017/06/19/police-operation-way-champs-elysees-paris/. Stephen Burgen, “Spanish Attacks Death Toll Rises to 16 after Woman Dies in Hospital,” Guardian (London), August 27, 2017, https://www.theguardian.com/world/2017/aug/27/death-toll-spain-terror-attacks-rises-barcelona. On September 30, 2017, an assailant launched two vehicular terror attacks in Edmonton, Canada, collectively injuring five people. In the first attack, the assailant used a car to ram into a police officer before exiting the car and stabbing him. The assailant later used a truck to ram into pedestrians, injuring another four people. An ISIS flag was later found in the suspect’s vehicle.Madison Park and Dakin Andone, “Five Hurt as Edmonton Attacks Spark Terror Investigation,” CNN, October 2, 2017, http://www.cnn.com/2017/10/01/americas/edmonton-vehicle-attacks-investigation/index.html. Despite the recent uptick in ISIS-claimed attacks, vehicular attacks are not a new phenomenon. Terrorists have carried out car-ramming attacks for more than a decade, in locations ranging from North Carolina“Terrorist Use of Vehicle Ramming Tactics,” Federal Bureau of Investigation, December 13, 2010, https://info.publicintelligence.net/DHS-TerroristRamming.pdf. to Jerusalem,Jeffrey Heller and Avida Landau, “Palestinian Kills 3 in Jerusalem Bulldozer Attack,” Reuters, July 2, 2008, http://uk.reuters.com/article/us-israel-tractor-idUKL0243020020080702. Tel Aviv,Alexander Marquardt and Bruno Nota, “Terror Attack Outside Tel Aviv Nightclub Filled With 2,000 Teenagers,” ABC News, August 29, 2011, http://abcnews.go.com/International/palestinian-drives-stolen-taxi-israelis-stabs/story?id=14403744. Quebec,Ian Austen, “Hit-and-Run That Killed Canadian Soldier Is Called Terrorist Attack,” New York Times, October 21, 2014, https://www.nytimes.com/2014/10/22/world/americas/canadian-soldier-run-down-in-what-officials-call-act-of-terror-dies.html. Dijon,“French Driver Reportedly Heard Yelling ‘Allahu Akbar’ Slams Pedestrians, Injures 13,” Fox News, December 22, 2014, http://www.foxnews.com/world/2014/12/22/in-tense-france-driver-rampages-in-lyon-area-slamming-into-passersby.html.Nantes,Guillaume Frouin, “Man Rams Van into Christmas Market in France,” Reuters, December 23, 2014, http://www.reuters.com/article/uk-france-crash-idUKKBN0K01Q120141223. the West Bank,Ilan Ben Zion, “Palestinian Vehicle Smashes into IDF Soldiers in West Bank,” Times of Israel, November 5, 2014, http://www.timesofisrael.com/car-rams-west-bank-bus-stop-in-possible-fresh-terror-attack/; “Palestinian Confesses to West Bank Car-Ramming Attack,” Times of Israel, May 14, 2015, http://www.timesofisrael.com/palestinian-confesses-to-west-bank-car-ramming-attack/; Stuart Winer, “Hamas and Islamic Jihad Praise ‘Brave’ Attack, Call for Escalation,” Times of Israel, August 6, 2015, http://www.timesofisrael.com/hamas-and-islamic-jihad-praise-brave-attack-call-for-escalation/; “Lapid: PM Using Latest Car-Ramming Attack to Deepen Societal Divide,” Times of Israel, August 7, 2015, http://www.timesofisrael.com/lapid-pm-using-latest-car-ramming-attack-to-deepen-societal-divide/; “Soldier Lightly Hurt in Suspected Car-Ramming Attack,” Times of Israel, August 30, 2015, http://www.timesofisrael.com/soldier-lightly-hurt-in-suspected-car-ramming-attack/; Gili Cohen, “Four Wounded in Car-Ramming Attack at Tapuah Junction, West Bank,” Haaretz (Tel Aviv), November 24, 2015, http://www.haaretz.com/israel-news/1.687957; Adiv Sterman and Raoul Wootliff, “IDF Soldier Said Lightly Hurt in Possible Car-Ramming Attack,” Times of Israel, January 26, 2016, http://www.timesofisrael.com/idf-soldier-said-lightly-hurt-in-possible-car-ramming-attack/; “Four Israeli Border Police Injured in Suspected Car Ramming in West Bank,” i24NEWS, February 13, 2016, https://www.i24news.tv/en/news/israel/diplomacy-defense/102735-160213-hebron-palestinian-assailant-attempts-to-stab-israeli-soldier-is-shot-dead; Judah Ari Gross, “Troops Thwart Attempted Car-Ramming in West Bank,” Times of Israel, February 19, 2016, http://www.timesofisrael.com/troops-thwart-attempted-car-ramming-in-west-bank/; Judah Ari Gross, “Soldier Lightly Hurt in West Bank Car-Ramming Attack,” Times of Israel, March 4, 2016, http://www.timesofisrael.com/israeli-lightly-hurt-in-apparent-west-bank-car-ramming-attack/; Yaakov Lappin and Daniel K. Eisenbud, “Gun Attack Followed by Car Ramming Near Hebron; 3 Palestinian Terrorists Shot Dead,” Jerusalem Post, March 14, 2016, http://www.jpost.com/Arab-Israeli-Conflict/Initial-report-Attempted-car-ramming-attack-at-Kiryat-Arba-entrance-447827; Tovah Lazaroff, “3 Soldiers Wounded in Vehicular Terrorist Attack Near Talmon,” Jerusalem Post, May 3, 2016, http://www.jpost.com/Arab-Israeli-Conflict/Report-Palestinian-allegedly-rams-car-into-three-Israelis-in-West-Bank-452993; Tovah Lazaroff, “Watch: Security Cameras Capture Car Ramming Attack Near Kiryat Arba,” Jerusalem Post, June 24, 2016, http://www.jpost.com/Israel-News/One-lightly-injured-in-attempted-car-ramming-attack-in-Kiryat-Arba-457628; “Palestinian Attempts To Injure Israeli Soldiers In Car-Ramming, Stabbing Attack,” i24NEWS, October 29, 2016, http://www.i24news.tv/en/news/israel/diplomacy-defense/128812-161029-palestinian-attempts-to-injure-israeli-soldiers-in-car-ramming-stabbing-attack; Tovah Lazaroff and Anna Ahronheim, “Israeli Soldier Killed in West Bank Ramming Attack,” Jerusalem Post, April 6, 2017, http://www.jpost.com/Arab-Israeli-Conflict/Initial-report-Suspected-car-ramming-attack-in-West-Bank-486259; Judah Ari Gross, “Israeli Man Lightly Hurt In West Bank Car-Ramming Attack,” Times of Israel, April 19, 2017, http://www.timesofisrael.com/israeli-man-lightly-hurt-in-west-bank-car-ramming-attack/. Graz,Melanie Hall, “Bosnian ‘With History Of Beating Wife’ Accused Of Ploughing Car Into Austria Crowd,” Telegraph (London), June 21, 2015, http://www.telegraph.co.uk/news/worldnews/europe/austria/11689726/Graz-car-attack-kills-three.html. and Xinjiang,“Vehicle Ramming Attacks,” Transportation Security Administration, May 2017, https://info.publicintelligence.net/TSA-VehicleRamming.pdf. The recent uptick in vehicular attacks, however, appears to have been in large part inspired by ISIS’s explicit calls to employ cars as weapons. In May 2017, the U.S. Transportation Security Administration (TSA) issued a warning to truck and bus companies urging companies to watch out for potential vehicular terrorist assailants and listing more than a dozen car-ramming attacks since 2014 that have collectively killed more than 170 people.CEP has has added to the TSA’s findings, identifying several other terrorist incidents during this period and since 2006. As the TSA wrote in its memo, terrorists groups will likely continue to encourage "unsophisticated tactics such as vehicle-ramming" since these types of attacks are difficult to prevent and "could inflict mass casualties if successful. "Jason Hanna, “TSA Warns Truckers: Watch For Possible Ramming Terror Attacks,” CNN, May 5, 2017, http://www.cnn.com/2017/05/04/politics/tsa-ramming-terror-attacks-warning/. Terrorist groups like al-Qaeda, ISIS, and Hamas have long called for—and claimed responsibility for—vehicular terrorist attacks. Al-Qaeda’s second issue of Inspire magazine, released in October 2010, contained an article calling for vehicular attacks and referring to a pickup truck as a potential “mowing machine” that can be used to “mow down the enemies of Allah.”Yahya Ibrahim, “The Ultimate Mowing Machine,” Inspire, October 2010. Inspire editor-in-chief Yahya Ibrahim urged al-Qaeda followers to “[g]o for the most crowded location” and “pick up as much speed as you can” in order “strike as many people as possible.”Yahya Ibrahim, “The Ultimate Mowing Machine,” Inspire, October 2010. An FBI memo released in December of that year noted the emerging danger from vehicular attacks, which may allow terrorists with “limited access to explosives or weapons” the ability to conduct an attack with “minimal prior training or experience.”“Terrorist Use of Vehicle Ramming Tactics,” Federal Bureau of Investigation, December 13, 2010, https://info.publicintelligence.net/DHS-TerroristRamming.pdf. Following the October 31, 2017, truck-ramming attack in New York City, several old images praising vehicular and other attacks reappeared on pro-ISIS channels on the encrypted messaging service Telegram. In addition, ISIS propaganda calling for vehicular attacks was accessible online the same day of the attack. An old ISIS propaganda image from Nashir, a news organization affiliated with the group, recirculated on a pro-ISIS Telegram channel on October 31, 2017. On October 16, 2017, an Internet user uploaded to the U.S. Internet Archive an ISIS video instructing how to carry out a ramming attack. The video is a 26-second segment of the longer video, “We Will Surely Guide Them to Our Ways,” which features the self-identified American fighter Abu Hamza Al-Amriki, who encourages lone wolf attacks with knives and motor vehicles. The video also features several short clips of U.S.-based locations, including New York City’s Times Square. The video was originally released on May 17, 2017. 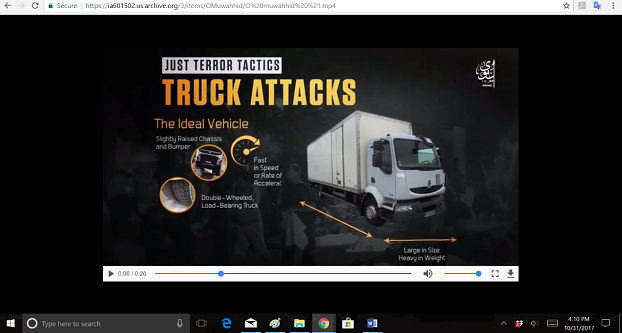 A 26-second video clip on truck attacks available on the Internet Archive, taken from the longer ISIS video “We Will Surely Guide Them to Our Ways,” (originally released May 17, 2017). CEP located the clip October 31, 2017. In September 2014, ISIS spokesman Abu Muhammad al-Adnani issued a call to kill non-believers using any means at their disposal. “[S]ingle out the disbelieving American, Frenchman, or any of his allies,” he said. “Smash his head with a rock, or slaughter him with a knife, or run him over with your car.”Yara Bayoumy, “Isis Urges More Attacks On Western ‘Disbelievers,’” Independent (London) September 22, 2014, http://www.independent.co.uk/news/world/middle-east/isis-urges-more-attacks-on-western-disbelievers-9749512.html. In November of that year, French foreign fighter Abu Salman al-Faranci appeared in a video reiterating ISIS’s call for followers—particularly in France—to carry out domestic attacks if they could not join ISIS abroad. As Faranci said to his viewers: “Terrorize them and do not allow them to sleep due to fear and horror. There are weapons and cars available and targets ready to be hit.”Duncan Gardham, “ISIL Issued Warning to ‘Filthy French,’” Politico, November 15, 2015, http://www.politico.eu/article/paris-terrorist-attacks-isil-issued-warning-to-filthy-french/. In mid-November 2016, ISIS’s third issue of online magazine Rumiyah included an article calling for its followers to carry out vehicle attacks. The article specified the ideal type, weight, and speed of a car needed for terror purposes, and encouraged attacks on “large outdoor conventions and celebrations, pedestrian-congested streets, outdoor markets, festivals, festivals, parades[, and] political rallies.”“Just Terror Attacks,” Rumiyah, November 2016. Later that month, Somali-born Abdul Razak Ali Artan carried out a car and knife attack at Ohio State University, wounding 11 people. Katie Mettler, “Ohio State Attacker Complained Bitterly in Facebook Post of Treatment of Muslims ‘Everywhere,’ Report Says,” https://www.washingtonpost.com/news/morning-mix/wp/2016/11/29/ohio-state-attacker-in-facebook-post-complained-bitterly-of-treatment-of-muslims-everywhere-reports-say/. Following the wave of vehicular terrorist attacks in 2016 and 2017, ISIS has continued to issue calls to violence and warnings of additional car-ramming attacks. On May 17, 2017, the group released a video threatening attacks in the United Kingdom, Europe, and the United States, especially in New York, Las Vegas, and Washington, D.C. ISIS has also threatened and encouraged vehicular attacks on gay pride parades.“We Will Surely Guide Them To Our Ways,” Islamic State Wilayah Ninawa, May 17, 2017; CEP, Twitter post, June 4, 2017, 3:53 p.m. EST, https://twitter.com/FightExtremism/status/871137860346404864. In June 2017, an account operating under the name of ISIS’s Nashir agency released a renewed call for ISIS supporters to “[r]un over people by vehicles and [c]ut off their necks in any time [sic].”Counter Extremism Project. ISIS and al-Qaeda are not the only terrorist groups to urge or claim credit for vehicular terrorist attacks. One of the first documented vehicular attacks was carried out by an unaffiliated Iranian-American, who wounded nine people at the University of North Carolina in 2006.“Terrorist Use of Vehicle Ramming Tactics,” Federal Bureau of Investigation, December 13, 2010, https://info.publicintelligence.net/DHS-TerroristRamming.pdf. As the assailant Mohammed Reza Taheri-azar told investigators, he had had carried out the attack in an effort to punish the U.S. government and “avenge the deaths or murders of Muslims around the world.”Associated Press, “Man Is Charged After Driving Into Group of Students,” New York Times, March 5, 2006, http://www.nytimes.com/2006/03/05/us/man-is-charged-after-driving-into-group-of-students.html. A slew of car-ramming attacks have also been carried out by Palestinian assailants in Israel and the West Bank. In November of 2014, Hamas and other Palestinian terrorist groups—including the Palestinian Islamic Jihad (PIJ)—praised a wave of vehicular attacks and called for more. One such image posted online read, “Run [them] over, son of Hebron...and son of Jerusalem. Take your car...and run over the Zionists.”“Vehicular Attack in Jerusalem,” Meir Amit Intelligence and Terrorism Information Center, November 6, 2014, http://www.terrorism-info.org.il/en/articleprint.aspx?id=20726. Terrorists have carried out attacks using cars and trucks in a wide range of countries, including the United States, United Kingdom, France, Canada, China, Germany, Israel, and Belgium. In some cases, assailants have used gas canisters or other explosives to supplement the potential damage from car-ramming attacks. This type of planning could be seen in the June 2007 Islamist attack targeting Glasgow Airport in Scotland,Associated Press, “4 Arrested In Glasgow Incident; Officials Link It To London Events,” USA Today, July 1, 2007, http://usatoday30.usatoday.com/news/world/2007-06-30-britain-saturday_N.htm. the May 2014 attack in China’s Xinjiang province,“Vehicle Ramming Attacks,” Transportation Security Administration, May 2017, https://info.publicintelligence.net/TSA-VehicleRamming.pdf. and the June 2015 attack on a gas plant in southern France. “France Attack: Man Decapitated at Factory near Lyon,” BBC News, June 26, 2015, http://www.bbc.com/news/world-europe-33284937. “Vehicle Ramming Attacks,” Transportation Security Administration, May 2017, https://info.publicintelligence.net/TSA-VehicleRamming.pdf. As the TSA notes, vehicular terrorist attacks are becoming “more commonplace around the globe.”Jason Hanna, “TSA Warns Truckers: Watch for Possible Ramming Terror Attacks,” CNN, May 5, 2017, http://www.cnn.com/2017/05/04/politics/tsa-ramming-terror-attacks-warning/. Indeed, terrorists are increasingly relying on low-sophistication tactics like car-ramming and stabbing to kill or injure large groups of people without easy detection or intervention by law enforcement. These assailants often target locations where large numbers of people congregate, particularly on or around major national holidays, when civilians are likely to be outdoors shopping or celebrating.For more on common terror targets, see CEP’s report, Terror Targets in the West: Where and Why. Although there is little that can be done to prevent the weaponization of motor vehicles, the TSA has encouraged bus and trucking companies to be vigilant about indicators—like modifications to vehicles—that may suggest a vehicular terrorist attack. The TSA has also encouraged the use of vehicle barriers to prevent vehicles from accelerating into populated areas, protecting large crowds of people from attacks at outdoor venues like concerts, sporting events, and holiday markets.“Vehicle Ramming Attacks,” Transportation Security Administration, May 2017, https://info.publicintelligence.net/TSA-VehicleRamming.pdf. As CEP notes, far more can also be done by tech companies to counteract calls to violence by groups like ISIS, al-Qaeda, and Hamas. After the March 2017 Westminster attack, YouTube was “inundated with violent ISIS recruitment videos,” according to findings by the U.K. government. The British government noted that YouTube failed to block this slew of content, despite the videos being easily searchable and posted under usernames like “Islamic Caliphate.”“Hate Crime: Abuse, Hate and Extremism Online Fourteenth Report of Session 2016–17,” U.K. House of Commons Home Affairs Committee, May 1, 2017, https://www.publications.parliament.uk/pa/cm201617/cmselect/cmhaff/609/609.pdf. After the June 2017 London Bridge attack, U.K. Prime Minister Theresa May called for increased regulation on the Internet, where terrorist recruitment and incitement to violence largely takes place remotely.“Theresa May Says the Internet Must Now Be Regulated Following London Bridge Terror Attack,” Independent (London), June 4, 2017, http://www.independent.co.uk/news/uk/politics/theresa-may-internet-regulated-london-bridge-terror-attack-google-facebook-whatsapp-borough-security-a7771896.html. Despite Google’s claims to have improved its takedown efforts, CEP has tracked the appearance and reappearance of major ISIS videos on YouTube (Google’s subsidiary), including those calling for vehicular terrorist attacks. CEP’s findings raise serious questions about Google’s stated commitment to confronting terrorist recruitment using hashing technology, which prevents flagged content from being re-uploaded to a platform. CEP has tracked the appearance and reappearance of major ISIS videos on YouTube calling for vehicular terrorist attacks. CEP’s findings raise serious questions about the company’s stated commitment to confronting terrorist recruitment on its platform. In many cases, assailants themselves are active on tech platforms like Google, Facebook, and WhatsApp prior to carrying out the attack. Abdul Razak Ali Artan, perpetrator of the November 2016 Ohio State University attack, called al-Qaeda cleric Anwar al-Awlaki “our hero” in a message posted to Facebook.Jake Trapper, Twitter post, November 28, 2016, 5:56 p.m., https://twitter.com/jaketapper/status/803417243547799552. Khalid Masood, perpetrator of the March 2017 Westminster attack, sent a message on WhatsApp announcing his intention to wage jihad minutes before launching his assault.Rozina Sabur, “Westminster Terror Attacker Khalid Masood's Final Message Revealed,” Telegraph (London), April 28, 2017, http://www.telegraph.co.uk/news/2017/04/28/westminster-terror-attacker-khalid-masoods-final-message-revealed/. While it is impossible to prevent all vehicular terrorist attacks, far more can and should be done to reduce the threat. Tech companies, for one, can do far more to prevent groups like ISIS, al-Qaeda, and Hamas from using their platforms to recruit new members and reach their target audiences. These companies can also be more proactive and cooperative with law enforcement about the activity of lone-wolf terrorists on their platforms. Although we cannot prevent each and every vehicular attack, efforts to prevent even a few attacks can have the foreseeably large impact of reducing widespread fear and, most importantly, saving lives.